As you grow older you’ll probably notice yourself having difficulty falling and staying asleep. Although common, this isn’t normal nor is it a consequence of aging. Instead senior sleep issues are typically linked to lifestyle and environmental factors. This is important to pay attention to because it can gravely impact the rest of your health and life. Fortunately, there are some things you can do to help you sleep better. • Make sure you’re using the right mattress. As you age, your body grows more sensitive to pain and discomfort so you’ll want to make sure you have the right support, firmness, and pressure relief. • Make sure your home has good air quality. Pollutants, allergens, and dryness can make you uncomfortable and keep you up at night. • Consider using a humidifier to improve your home’s air quality and your senior sleep, especially if you have respiratory issues. There’s an important relationship between your diet and your sleep. It’s not only the food you eat right before bed (e.g. chocolate, alcohol, fatty foods), it’s also your overall diet. You need a healthy one so your body can properly absorb the nutrients it needs for good senior sleep. This diet will also help you maintain an active lifestyle and when you’re more active you’ll sleep better at night. Strenuous exercise makes you tired so you fall asleep easily. However, when you exercise regularly you’ll sleep better, which will also help you exercise better. This is why you must incorporate exercise into your daily routine. You can start doing this by investing in a pedometer or a fitness tracker to track your daily steps, distance traveled, and calories burned. Seeing these numbers will motivate you to exercise enough. Improving your diet, exercise habits, and sleep environment will make a huge difference in the quality of senior sleep you get. Sometimes these changes still won’t be enough though. When this happens, you’ll want to talk to your doctor because they can determine if you have a sleep disorder and give you additional advice on how to improve your sleep – even if you don’t have a sleep disorder. Your hearing is another important factor in making sure you get plenty of restorative sleep. 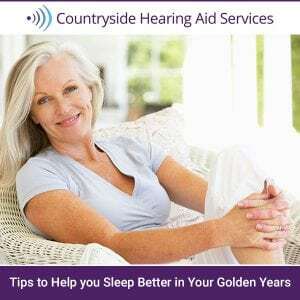 Hearing loss can oftentimes increase stress and anxiety in a person’s life, both of which can make getting a good night’s sleep more difficult. Determining if you have hearing loss is easy. Call Countryside Hearing at 727-796-1161 and we will schedule a complimentary hearing evaluation for you. Regardless of what’s going on around you, a good night’s rest is something you deserve and that’s well within your reach, so you should never settle for poor sleep.